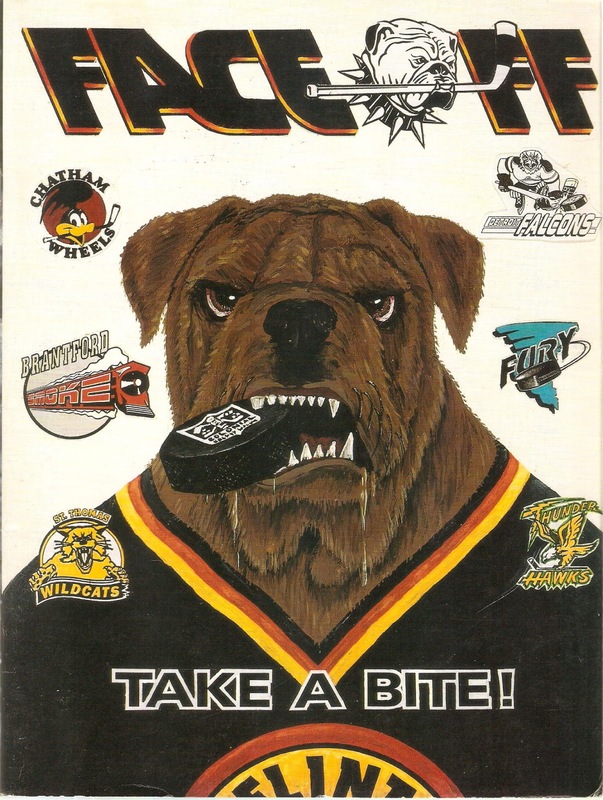 After the Spirits left town, Flint went without hockey for the 1990-91 season. After years in the Triple-A level IHL, Flint simply couldn't afford a franchise in league with so many expenses. Despite rumors of an expansion franchise in the ECHL, Flint became part of the new Colonial Hockey League, a Double-A league at it's best, a glorified beer league at it's worst. Flint's team was owned by Leslie J. "Skip" Probst, who was also Coach/GM. The other four charter members of the Colonial League were in Ontario and Michigan. The Bulldogs lasted only two years, and I haven't really seen any programs from them for sale. Here's the one I have. The Bulldogs kicked off the inaugural season of the Colonial League by finishing dead last in the five-team league, going 20-37-3. The Bulldogs' second season was slightly better, as they stumbled to a 27-29-4 record, sixth place in the league and 23 points behind first place Brantford. The Bulldogs did feature a few ex-Spirits, including defensemen Brett MacDonald, Stephane Brochu and Ken Spangler. Mike Jorgensen led the offense with 63 points on 27 goals. In net, Pat Szturm and Mark Gowans nearly split the games between each other. The Dogs also had tough guy Darren Miciak, who racked up 396 PIM in 53 games. While the Bulldogs limped into the playoffs, their stay was short-lived. Their opponent was the first-place Brantford Smoke, led by former MSU forward Paul Polillo and ex-Islanders goalie Rollie Melanson. The Smoke knocked off the Bulldogs in six games, on their way to winning the Colonial Cup. While the Bulldogs drew the second-largest crowds in the league, 2,238 per game was not enough to keep the franchise afloat. The fanbase simply did not care for the Bulldogs mediocre play on ice or owner Skip Probst. After the season, Probst moved his franchise to Utica, New York, declaring that Flint could no longer support pro hockey. Great-looking program, isn't it? Someone put some time into the design of this. The team was no good, but at least the program design was sharp.